The Long Island Sports Photo Network- a collection of some of the best photographers in the New York area, is committed to providing high quality sports photography to Long Island’s young athletes. Our photographers have been published in both national and international publications, in such places as The Hockey News, Newsday, Sports Illustrated, and many other books, magazines, and newspapers. We believe high quality photography is the perfect way to capture these “golden years”, when kids play sports for the love of the game, and no other reason. We offer a wide selection of products, and shoot events using only the highest quality, state-of-the-art pro-digital cameras and lenses. You now have a choice as to when you view, order and receive your prints. LiSPN now offers onsite viewing and ordering at select tournaments and action events! Now, you can preview photos at one of our computerized viewing stations, and then place your order before you ever leave the field!. Our online ordering system allows you to preview images from the games in the comfort of your own home. Within 24 hours, the photos are online and ready. Through our website, we also offer a wider variety of products, including magazine covers and posters. Most orders arrive at your home within 10 business days! LiSPN also offers the best in Team and Individual photography. Our highly trained crew of professionals can accomodate all of your league’s photo needs. We can arrange to shoot your league indoors or outdoors. Indoors, we use specialized backdrops and lighting setups, exactly the same way we’ve shot the pros. We offer a wide range of packages to suit any budget, and a variety of products to suit everyone. All of our borders are custom designed by our in-house design staff. You won’t find them anywhere else. We can also add your league’s logo to any of our borders. If you are involved in a youth sports program, and would like us to photograph your games, go to our registration page and let us know! Shane got his start as a photographer shooting for his high school year book. He attended college for Photographic Imaging, and began assisting wedding photographers. A year later, he merged his love for sports with photography and formed Power Photography. Where he offered professional Sports, Model and wedding photography. After about 6 years Shane wanted to focus strictly on his passion which was sports so he created and founded LiSPN the Long Island Sports Photo Network! Shane has been published in numerous publications, including Newsday, and their prep sports magazine, Hi-Five. He is also a regular contributor to The Traveler Watchman of Southold. Shane has been awarded Best News Photo and Photo of the Year by the New York Press Association, and continues to freelance for Newsday, New York Sportscene, and others. He has photographed the NFL, NHL, NBA and Major League Baseball. Paul’s background in baseball and youth sports allowed him to merge his two passions… sports and photography. 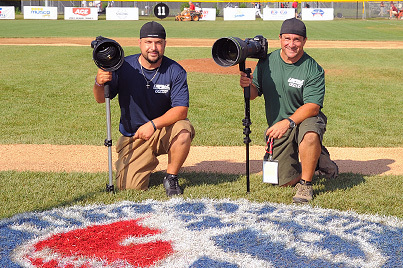 His images have served as the benchmark for “youth sports action” and he has quickly emerged as the premier baseball photographer for Little League Baseball Inc. His images of the Little League East Region Tournament and Little League World Series have set the standard among youth baseball action photos. Paul is a frequent contributor on several online sports photography forums and has written field guides on how to photograph Little League Baseball. Paul met Shane in the spring of 2005 and has photographed a variety of youth sports for LiSPN including, soccer, swimming, lacrosse, basketball, wrestling, cheerleading, football, hockey, and of course, baseball. In 2008 Paul became a permanent fixture at LiSPN as a owner. Paul holds a M.A. in Education from Stony Brook University and when not behind the lens, he teaches 6th grade English and Science in Smithtown, NY.